As for covert Russian military participation in the events in the region, if there was such, it has been insignificant. The armed clashes of the past several days have made it clear that the pro-Russian rebels have only a very small core of people with real combat training. An important role in that core group, it would appear, belongs to Russian nationalists with real combat experience behind them, but their attitude to the Russian state is ambiguous, to say the least. The man leading the armed militia in Slavyansk, Igor Girkin-Strelkov, judging by data available so far and by his own statements on internet forums, adheres to rather radical nationalist views. He likes the current ruling regime in Russia no more than do the participants in opposition protests in Moscow’s Bolotnaya Square. His image is further enhanced by the richness of biographical details he himself has made public (including information on where he used to serve), the lack of even the most basic effort to maintain secrecy, and his involvement with the historical re-enactment movement. The shoulder-fired air defense system that was used on the first day of fighting was most probably seized by the rebels when they disarmed units of Ukraine's 25th Airborne Brigade. In Soviet times, each airborne company was supposed to have four portable air defense systems, and one can assume that today's regulations in the Ukrainian armed forces are not that much different. The fact that since the first day of heavy fighting the system has not been used again confirms that it was booty, most probably the sole such system seized, with few munitions. The role the Russian secret services play in the drama unfolding in southeast Ukraine consists in no more than watching the situation and, perhaps, maintaining contacts with individual militia leaders. Russia intends to sit and watch Kiev suppress the rebellion in the southeast. There are probably two reasons for this. The first is the fear of economic sanctions that the U.S. and Germany have threatened to impose in the event of any military intervention. The second is that Moscow does not want to get involved in a conflict that could be potentially destructive for its economy over large territories with large economic problems and a predominantly Ukrainian population whose sentiments are far from uniform, which Russia has never been particularly interested in. It would however be erroneous to interpret this as a sign that an end to the Ukrainian crisis is in sight. A military operation, conducted by poorly trained troops and with support of paramilitary nationalist groups, cannot but cause anger among the population. The tragic events in Odessa will only make this anger worse. This is a powerful time bomb planted under Ukrainian statehood for generations to come. The prospects of that statehood were unclear as it is. After Yanukovych was overthrown, Ukraine reaped all the possible evils of a revolution except its only possible benefit: a change of political elite. All the visible presidential candidates, including Yulia Tymoshenko, have a long history in Ukrainian power. At different times, all of them have been perceived as an epitome of local corruption. Ukraine is doomed to a long political crisis with a further radicalization of politics, with the factors of ethnicity, language and religion coming to the fore. 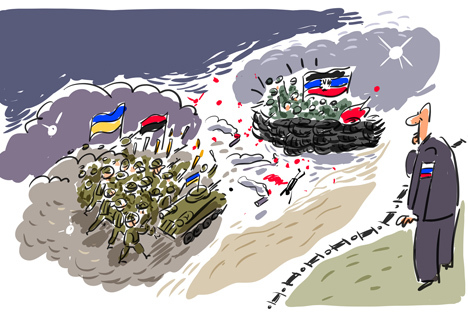 Russia, the EU and the U.S. will inevitably be drawn into all new domestic Ukrainian upheavals. Given the mutual distrust their leaders have displayed, confrontation between them is set to continue. Furthermore, after Russia’s annexation of Crimea, the U.S. has the important task of restoring its strongly undermined clout by punishing Russia, turning it into a rogue state. Direct and indirect sanctions will be imposed against Russia gradually over a period of many years, as the European and U.S. economies become prepared for them.